Want some kale? 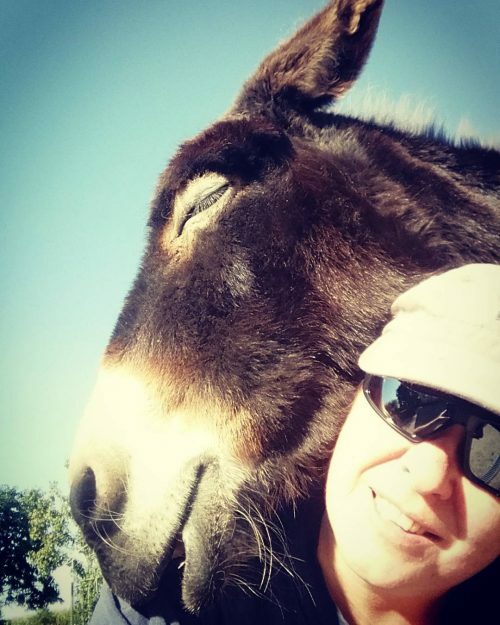 Our 2015 veg harvest and lessons learned! 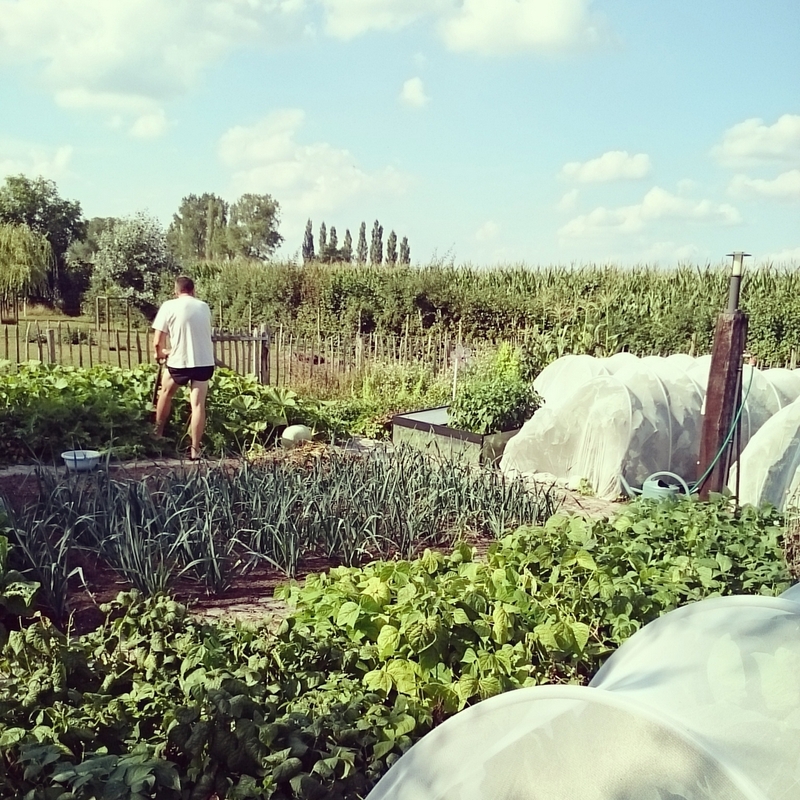 Vegetable garden, Summer 2015. Beneath the veils are the cabbages. Haricots in front. Leeks – pumpkins upper left. Leafy greens and sweet corn upper right. This is the evolution of the cabbages, from seeding – seedlings – to harvest! most pumpkins DO need a couple of square meters. so do not squeeze another plant in there, they will be too close together! cauliflower and romanescu are the more difficult cabbages. 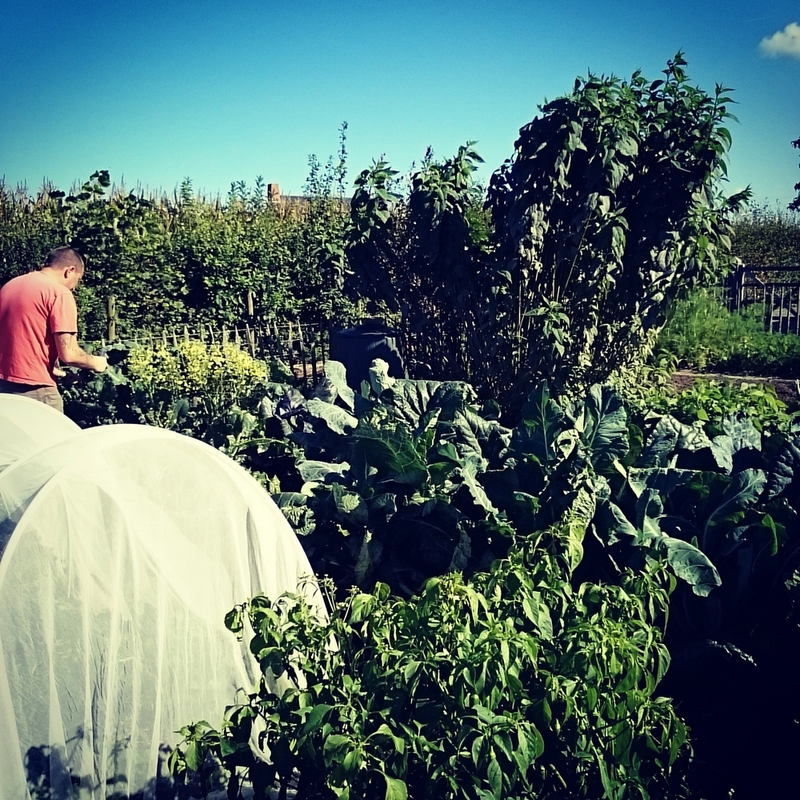 Brussels sprouts, red and savoy cabbage are relatively easy, kale is very easy to grow. 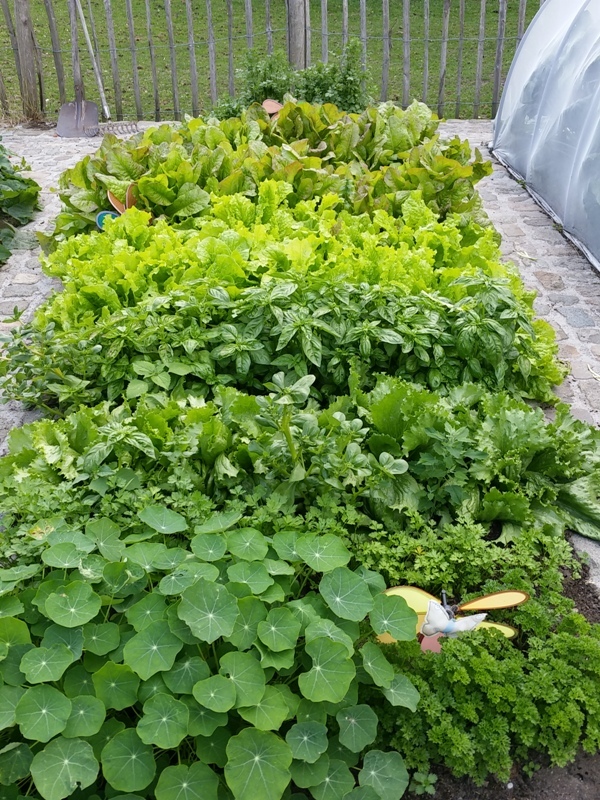 seed less leafy vegetables. Although we love our salads, we do not eat buckets full of them, and one can only make that much lettuce soup! I want more sweet corn! find something to keep the mice (?) from eating the pea seeds. I love you darlings, and I don’t mind sharing, but it’s no fun if you take all my pea seedlings (my 3rd attempt was more or less succesful). keep an eye on the fennel to harvest it in time! Otherwise you end up with one hard chewy stem. How do we keep and store all these vegetables? Some are of course eaten right a way, others go in the freezer, we also do a lot of canning (the old fashioned way – with weck jars) and the potatoes and nuts are just stored in our cellar! And yes, our cellar is pretty well stocked, you can take a peek into it in this short video HERE. I plan to write a blogpost with some generals tips about canning (wecking) in the upcoming months! Vegetable garden. Peppers in front. Cabbages beneath veil and in middle. The big stems are Jerusalem artichoke. 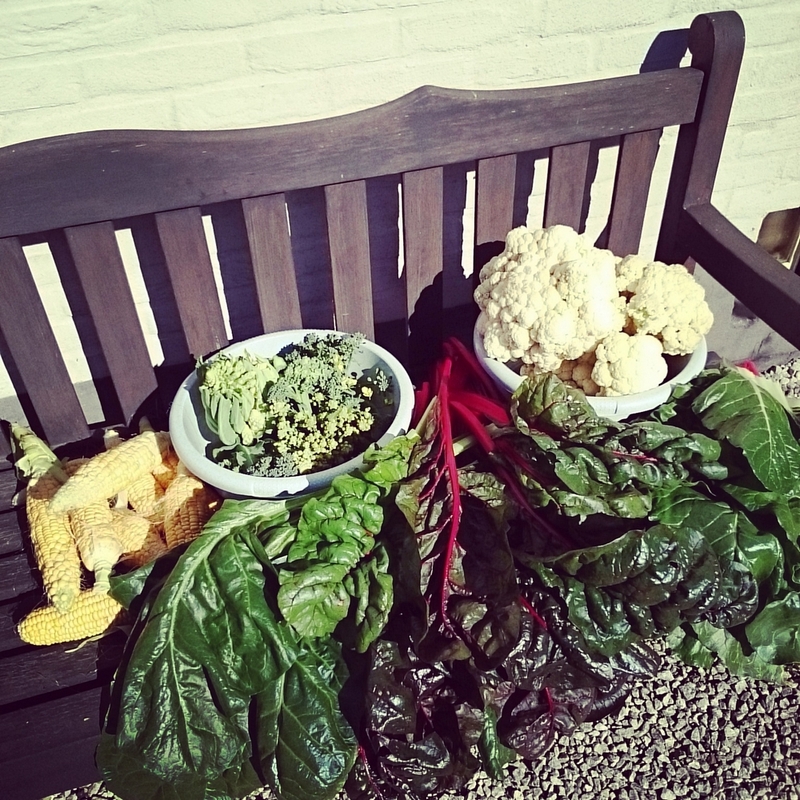 a varied harvest from our veg garden! Garden(and garden photography) looks excellent! Ik heb nog steeds zo veel bewondering voor jullie moestuin! Echt om jaloers op te zijn :-). Hier hebben we ook ondervonden dat aan twee courgetteplantjes véél courgettes groeien en dat wortels best uitgedund worden. Erwtjes willen wij volgend jaar proberen, dus daar doen we best een net over dan? bedankt Stephanie 🙂 Heb jij ook een blog? De link van je gravatar lijkt niet te werken? Absolutely love the garden pictures and am excited to read about canning! Ik kan bijna niet wachten om er zelf aan te beginnen. This makes me so happy! What a beautiful, beautiful garden and harvest!